In addition to the fun at NR5M last weekend, I spent part of Sunday getting my station up and running at the new apartment. This mainly amounted to mounting and tuning my 20m hamstick and running cable to the radio. This doesn't sound like much on paper but it was a lot more engineering than that. 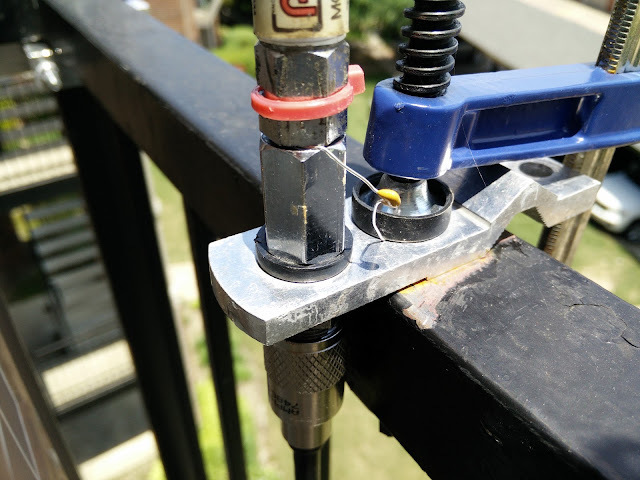 I started by scraping a bit of the paint off of the balcony railing as it would serve as the counterpoise for the hamstick. The bracket is held to the railing with a small clamp. Initial testing showed that it was secure enough to withstand some stormy weather. I'll probably still take the antenna off the mount if things get really windy. I whipped out the FG-01A analyzer from YouKits and got the tuning just right but as expected, the SWR was a little high at 2:1. A well tuned, high efficiency vertical will have a fairly low feedpoint impedance and I was showing about 23 ohms. The plan was to run RG-6 (75 ohm TV coax) so that'd give me a pretty bad match at around 3:1 VSWR. The coils in these compact mobile antennas can make them look a little long so adding some shunt capacitance at the base can help bring the feedpoint up into the proper range for good SWR without sacrificing much efficiency. I grabbed my junk box caps and started trying them out while monitoring the SWR at the end of the feedline. 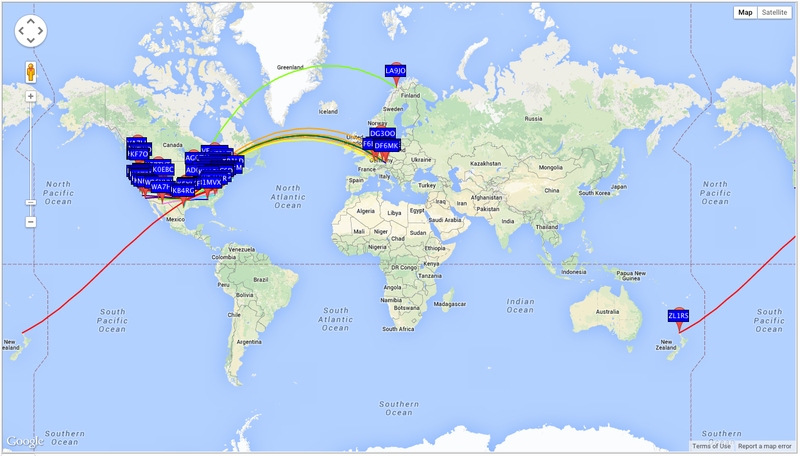 I found that 100pF worked perfect and got me right at 50 ohms at the transmitter end of the feedline. Unfortunately all I have are little 50v caps so hopefully this one will not blow up too quickly. Up until now, everything you've read was pretty easy. 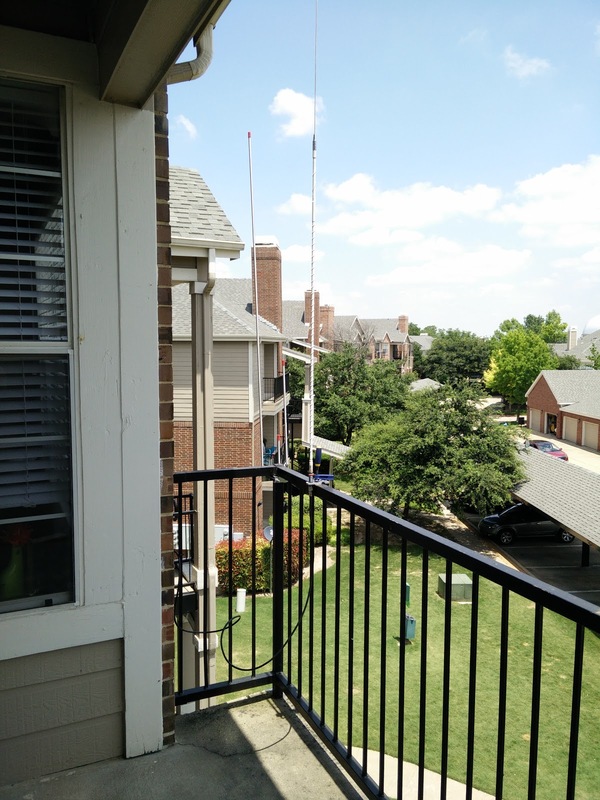 The hard part was going to be figuring out how to get the coax from the balcony to my desk, which is about 50' away. And I'm on the 3rd floor. And I don't want to just have coax hanging outside, drawing attention. Not to mention, how do I get the coax from the balcony to the window of the shack, 30' away, while I'm up 3 stories? There were a few options. I could pull the cable through the window closest to the balcony and run it inside to the shack, but that is probably the least preferred option for obvious reasons. I could run it mostly outside but snake it in and out of the windows across the living room wall, but then the coax has to be crushed in the sill many times. Also not a very good option. I was thinking more and more about the last option and it hit me, if I could somehow hold the coax on the sill outside the window, it would be invisible from the ground and mostly invisible from inside. I'd need some kind of hook to hold the coax against the bottom of the window but still be able to close the window. Now, we all have times that we doubt our abilities and I have that as much as the next guy, but there are also times when you do something that makes you think "I am pretty cool!" and this happens to be one of those times luckily! 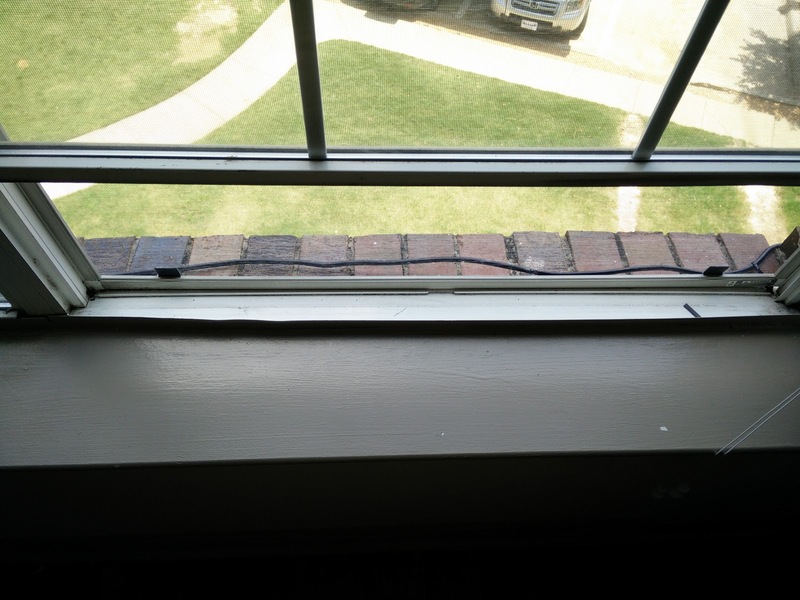 I devised a way to hold the coax to the window sill without it being visible from the ground and without impeding the operation of the window: zip ties. I looped the zip tie around the coax and squished it in the window sill under the screen. This gave the zip tie enough to grip to and hold the coax in place but still small enough that it did not bother the window at all. It's best understood by this picture. 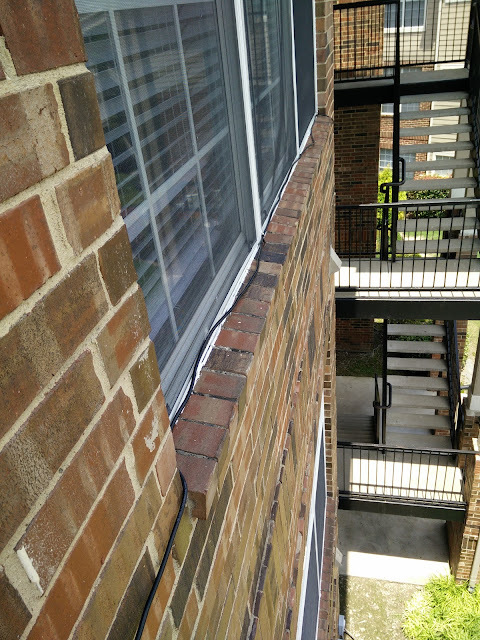 I tied off the coax across the sill 2 times on each window and it looks awesome! 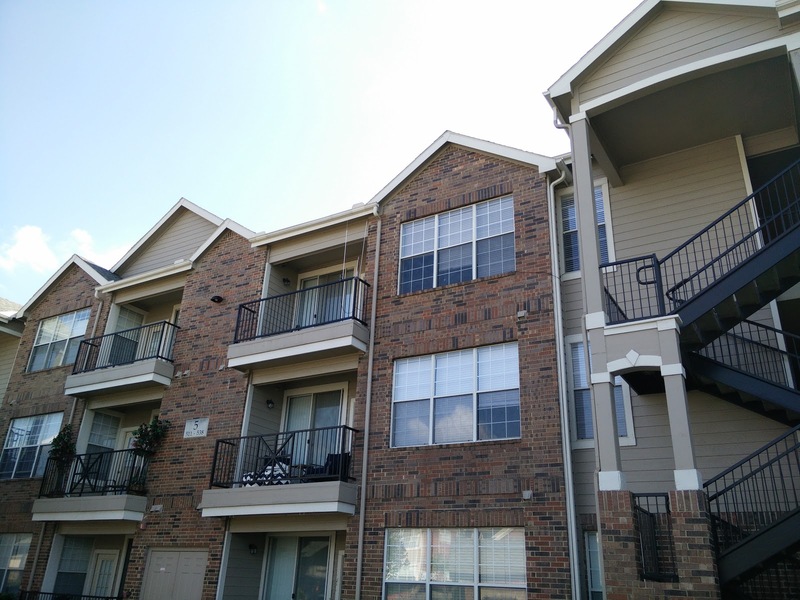 Here's a couple shots from the inside of the apartment and from the ground so you can see what the layman would see. It is pretty inconspicuous. I think the only way to improve the look would be to put some tall plant in the corner of the balcony to disguise the antennas a bit but I'm not sure it'll draw too much attention as-is. I'd say the antenna is working pretty well. Noise is low here, typically below S2, and as far as I know, I have not caused any interference. Win-Win! I'll keep you updated as the station continues to evolve and if any exciting DX comes in!